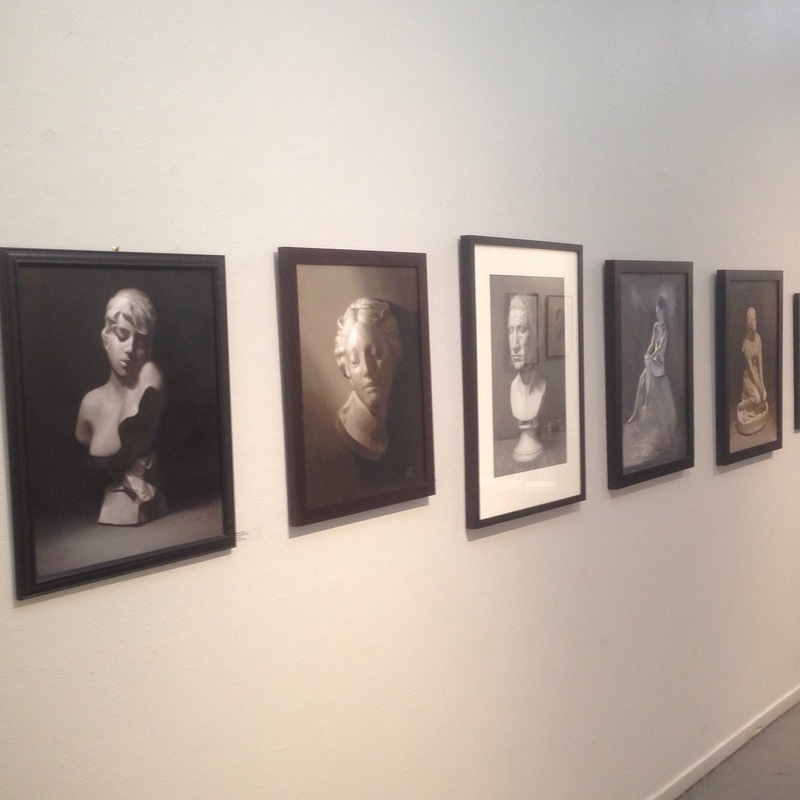 Exactly one month ago my long-labored cast drawing made its debut at our annual atelier show. The cast drawing is a major rite of passage in the first year of atelier training. The casts are replicas of classical sculpture. These copies of peices from live in places like the Louvre and the Vatican hang out in our studio creating a beautiful environment and giving us still life drawing and painting practice. The tradition of cast drawing goes back to the renaissance when artists like the great Raphael studied antiquity to recover knowledge lost in the dark ages. Today we study both renaissance and classical art for the same reasons. 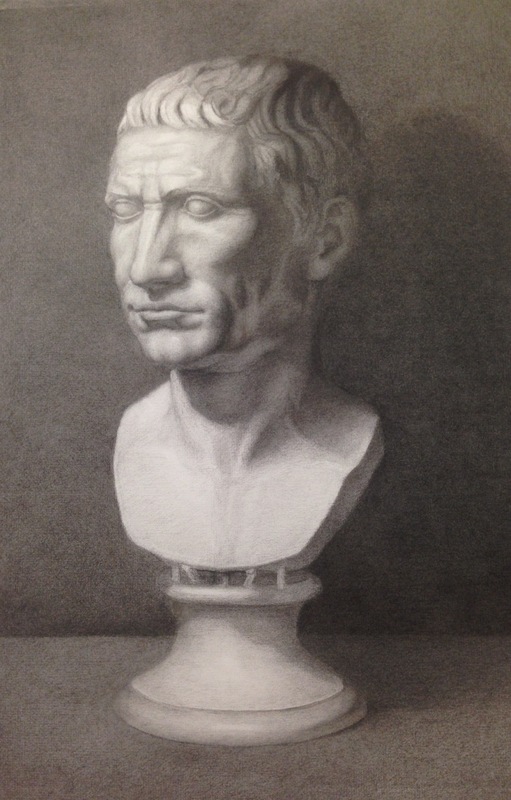 The cast I chose was a bust of Julius Caesar replicated from the one in the Vatican Museum. The drawing (above) is 16 x 24 inches. The cast is a regal portrait of a sober fellow but also a time capsule transporting us back into a world of masterful sculptors and builders working in the sprawling Roman Empire. I started the drawing in late February and was still scratching on it when it was time to put it in the show on May 19th. In that timeframe I also worked on Juliette’s book quite a bit, had a short spring break, and of course drew from life in the mornings. Otherwise it was me staring at that cast and that cast staring at me afternoons, nights and weekends for three months. This project is a giant leap of faith. You have to trust that the methods you have been learning will catch you when you take the plunge. For most of the process the drawing looks quite fragile, as if each new afternoon could be the one where you completely ruin it. I think I was repressing some nervousness because, although I slipped into a peaceful zen-like focus where hours and days became sand in an hour glass, my scalp started itching. I asked a classmate to check me for lice! No I didn’t have lice, but my classmate said she experienced the same itchy head a few years earlier when drawing her cast. The dermatologist told her it was stress. Upon hearing this I knew it was time to hit the climbing gym. Within a day my crawly scalp tingles went away. What a creepy reminder of the mind-body connection and how important it is for me to keep exercising no matter how intense the art monk training gets. I learned so much from this process, which I believe is akin to writing a thesis or dissertation. When it’s over you immediately have plans for a new, better work using all the skills you learned from making first one. But the learning was the learning objective of the first one and so it’s time to move on, raise the stakes and take on a different challenge.